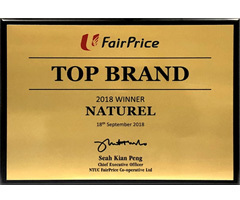 Naturel was one of the two local brands amongst the top 10 brands to be awarded the Top Brand 2018 during the NTUC FairPrice Suppliers Awards ceremony. Naturel garnered the award for its excellent sales growth performance and product quality. The brand is well represented in FairPrice stores, ranging from core products of cooking oils, olive oil and margarine, to organic extensions of brown rice, pasta, pasta sauces, extra virgin coconut oil and balsamic vinegar.